Nine Babies Take A Baked Bean Bath For Charity And Love It A Bit Too Much! They are quite literally beanie babies! When raising money for charity, there's nothing quite like - or anything much more disgusting than - a baked bean bath. 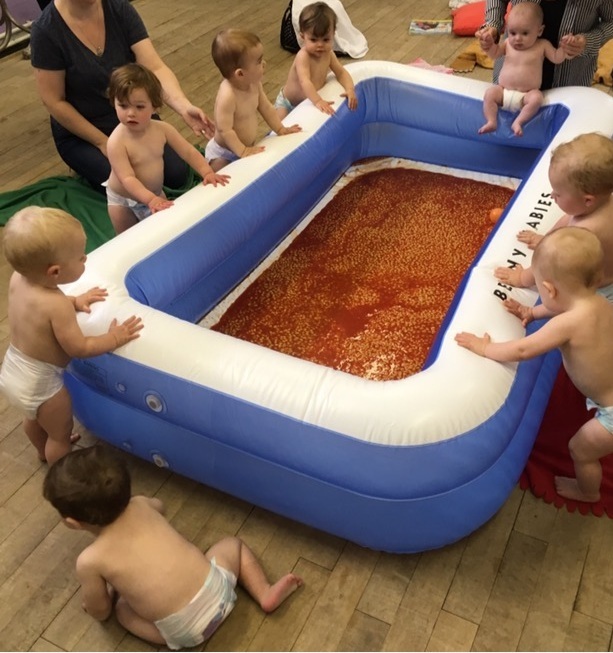 So when 27-year-old mum Laura Carson from Stockport was coming up with a way for her Little Monkeys Group to raise funds for charity, a group baked bean bath in a paddling pool seemed like the most sensible option. How very wrong she was. Read more: Granddaughter Of The NHS Founder Is Marrying Grandson Of The First Ever Patient! "The babies were covered in sauce and we gave them a bath in the kitchen. But quite a few didn’t stay in long and started screaming and clawing to get out,’ she said of about the Beany Babies event. "There was a lot of mess and we didn’t think about getting them out, which made even more mess. There was beans everywhere and some dried ones, it took a long time to clear up and it was absolutely disgusting, the place stank." It sounds like one of the most gross fundraising events ever - but also one of the most successful. The Little Monkeys raised £300 for charity Jump Save, which offers a safe and fun environment for disabled children.